If you are serious about selling your home and want to showcase it to look its best and sell for top dollar, then having someone with interior design experience on your team is crucial to success. 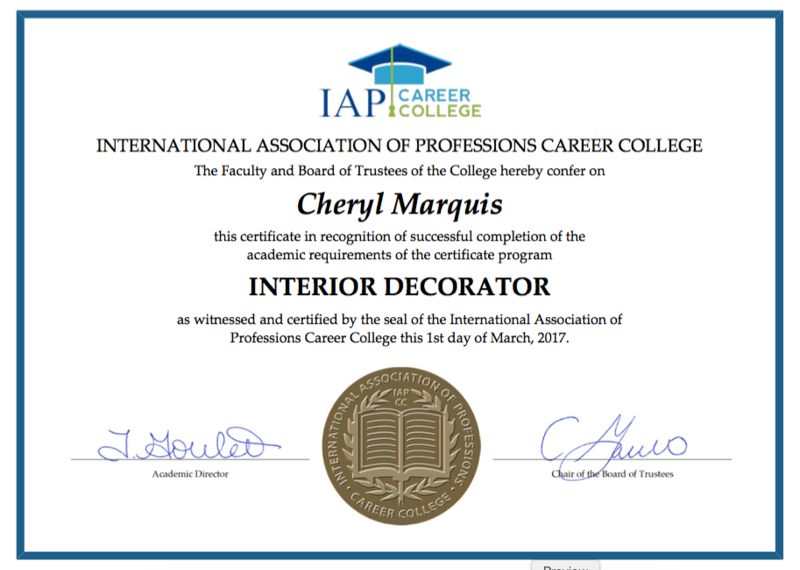 Aiming to provide the best possible service to her clients, seasoned real estate agent Cheryl Marquis is now offering an additional service to home sellers and buyers – interior decorating. Not only is Cheryl the best choice for your real estate agent because she’s a Certified Residential Specialist (C.R.S. ), Accredited Buyer’s Representative (A.B.R. ), Seniors Real Estate Specialist (S.R.E.S), and a Luxury Home Specialist, but she is also licensed as an interior decorator! Just another way she continues to set herself apart as a “cut above the rest”. Cheryl has helped many of her clients re-decorate their homes for sale. The result? A quick sale at top dollar! Below are a five more reasons you may want to hire a real estate agent who also has the knowledge and training of an interior decorator to ensure a speedy sale. It might sound strange that hiring someone to decorate your home would save you money since you have the additional fee of the designer, however hiring an interior designer can help you to avoid costly mistakes that will not only help you cut costs but increase the value of your home. An up-to-date, attractively decorated home can help boost buyer appeal and further set your home above the competition. An interior decorator who offers more than 3 decades of experience as a top producing real estate agent can provide you with a professional assessment of your situation and a solid plan of action. An agent who is also a designer can give you a professional design assessment of your home specifically as it relates to the visual experience potential buyers will have while touring your home; thereby increasing the odds of a “We love it” reaction. It need not be a complete home re-design, and the homeowner has complete control over which recommendations to go forward with, if any, but an agent who is a designer offers a uniquely qualified extra set of eyes, trained to see and notice things that you may not. If your home is in need of a “refresh”, an interior designer can keep you on budget and save you time and effort. Cheryl knows where to go for resources for everything related to your home. This will save you endless amounts of time researching products, brands, and prices. A few improvements many times adds a great amount to the aesthetic of your home, which in turn can increase showings and sales. This increased appeal can exponentially speed up the amount of time your home is “on the market” before it is sold. The benefit here is two-fold, a faster turn-around time and more money in your pocket. Designers can help to give you the “wow” factor to give you an advantage in our competitive real estate market. They are trained to think differently, spatially, and to see an overall picture that clients often cannot. Having your real estate agent as your decorator can also benefit you because they hear many critiques from all types of buyers, ensuring your home design will be on-trend and is ideal for current buyers. We are experiencing a strong, but competitive market where home values are up and buyers are eager to find their next dream home. If you are having thoughts of selling, call Cheryl Marquis today to discuss a unique, advantageous plan for your home, and find out how this could result in a quick sale for your home at a Top Dollar price for your property.